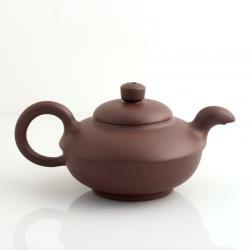 100% handmade teapot by Lu Ya Jun. This pot comes with a brochure of the artist and certification photo stamped with the artist's seal. This pot is 2.25" high x 3.25" in diameter. It holds approx. 140 cc.